Today closes the chapter of the year called July. It slipped by so quickly and was so full of activity that it is hard to believe that it is over and August is walking up the path to my door. I wish that I could convince July to remain for a few more weeks. Already the cool breezes have been blowing as August waits impatiently for the calendar to turn. Temperatures in the 50's, tying records for low temperatures seemingly ready to usher in a new Ice Age. I have not been able to enjoy the heat and humidity that I long for from July--and it is gone, just that quickly. enjoying the coolness of an Oregon summer day. And then there was the family celebration to which saw nearly the entire family gather for a few all too short days. It was at the sometime a busy and yet enjoyable month which passed too quickly. It was the perfect month, the trees around my house are in full leaf--and I know that as August arrives and then September that the canopy of green which surrounds me will only begin to thin and then disappear. Good-bye July. Your memories are strong and your time was far too short. It should be no huge surprise that I attended an Orioles baseball game last evening. What may be a surprise is that I departed the game before it was complete in an effort to ensure I received enough rest to make it through today. I left the game at the end of the 10th inning with the score tied 6-6. 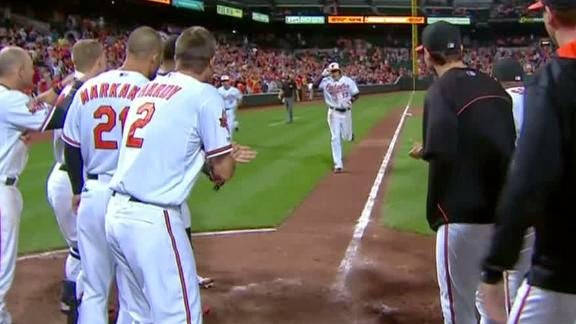 I arrived home during the bottom of the 12th inning just in time to enjoy Manny Machado's walk off home run to win the game for the Orioles. The time was about 11:10 PM when he slugged the game winner--or 4 hours and 5 minutes after the game began. I have begun to take an increased interest in the statistics of baseball lately. Baseball is rich in statistics and numbers and trends all of which would seem to be important, but it is important to remember that the game is still played by people and every at bat is a new event. For instance--When Machado came to the plate in the bottom of the 12 inning last evening, he was batting .268, or hitting about once for every four trips to the plate. He had never faced the pitcher before, and so there were no statistics, but he had never hit a walk off home run in his career. It was Machado's 6th at bat for the night, and he already had 1 hit, so he was batting .200 for the game, which is close to his average. Based upon the statistics, I believe the probability of Machado hitting a walk off home run was near zero. And yet it happened. In baseball, while statistics are valuable for explaining what happened in the past and which batter or pitcher is doing well or not; they are not definitive predictors of the future. Every at bat is a new event. That is why the game is played on the field and not by a computer. 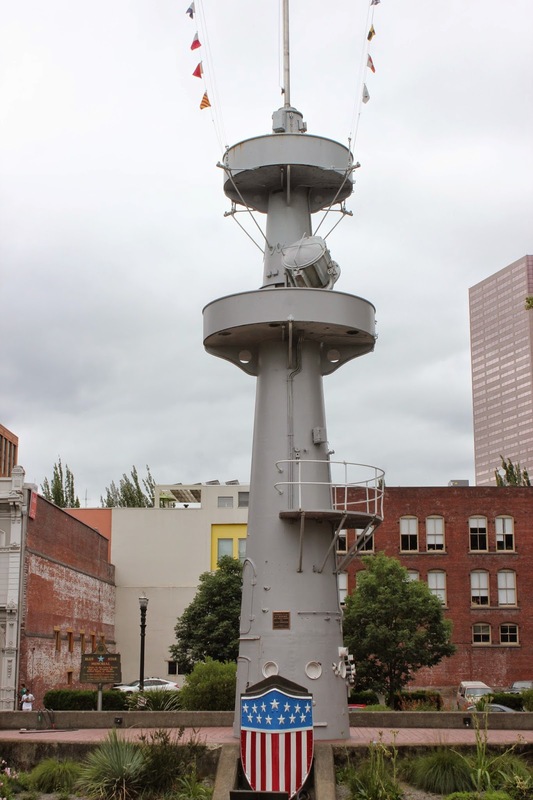 Walking around downtown Portland, along the river, I discovered some history with which I was unfamiliar. 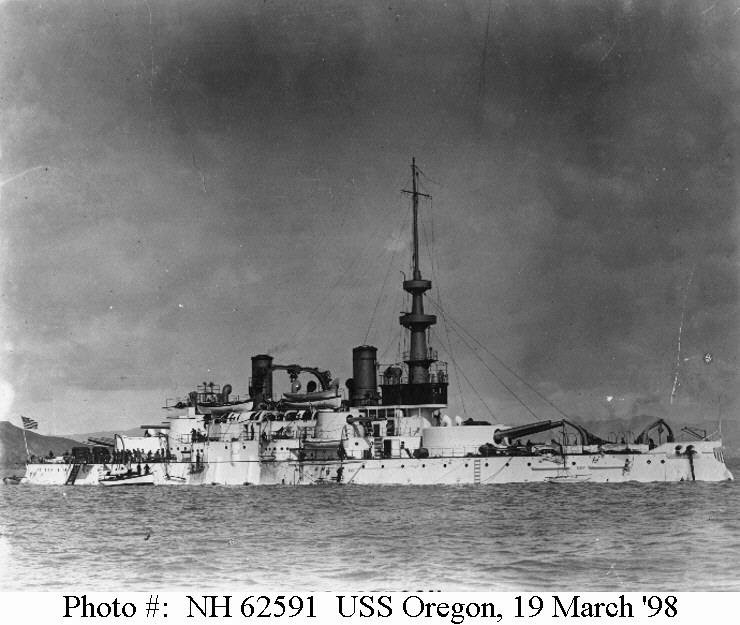 The story of the USS Oregon, BB-3. Turns out, the USS Oregon was one of the heroes of the Spanish American war when it sailed from California to Key West in 66 days--a record for the time. The ship was immediately pressed into action after war had been declared and was instrumental in the defeat of the Spanish Fleet. All that remains of this naval veteran is the main mast near the Portland Seawall with a small memorial. I was pleased to learn about the USS Oregon and its role in a war which usually begins with Remember the Maine and ends with Teddy Roosevelt and his Roughriders. Only three ships have been named Oregon. The Battleship Oregon being the most recent. The battleship's nickname was Bulldog of the Navy! And I found out about her in Portland. 1. I knew that my vacation was over this morning when my alarm rang. 2. The things you want the most are sometimes the things you already have. 3. Last week at this time I was in Portland, Oregon. Wow, how things change. 4. The saddest part about a vacation is when it ends. 5. I know that I have been away from work for more than two weeks because I had to look up the date this morning--and I was glad I did because I was a day off. 6. I wish that violence in the world would take a vacation. 7. I had the opportunity to watch the movie "Real Steel" again over the weekend and I was reminded of what I believe is the best line from the movie: "Your secret is safe with me." 8. The month of July ends this week and we transition into August where summer dreams die and autumn winds begin to blow. 9. 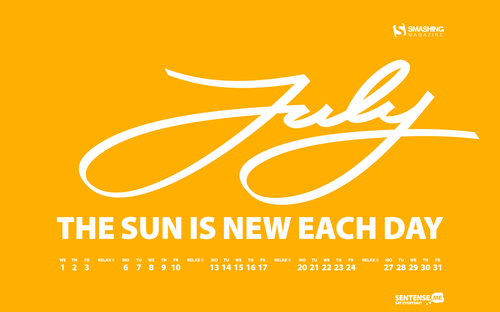 I have finally come to realize that July is my favorite month of the year! The family gathered together to celebrate a beginning. The event happened 60 years ago and from it has come a family. Four children, 10 grandchildren, 5 great grandchildren, and let's not forget the 9 spouses (of either children or grandchildren) who have been added to the clan. The official beginning was 60 years ago on a hot August summer day in Ithaca, NY. From the union of those two people, Mom and Dad, the family has grown to 30 people. On top of that, the group is spread across the country and living in 5 states (and that doesn't include the states of either confusion or chaos). Wow. It is something to consider. And to think that we were, with only a couple exceptions, gathered together in one place for the better part of a weekend is mind boggling. It was a memorable event. It was a celebration and a great time. Memories were made and relationships rekindled. Thanks to everyone who took part in the planning to make it happen. And thanks to everyone who carved out time to travel and participate. Sometimes we just need a good reason to get the entire clan together to reconnect and reestablish relationships and contacts. This weekend would be that weekend--a celebration of 60 years of marriage creating a great reason for the entire family, with only very few exceptions, to gather. Last evening the partying really got underway, as the majority of the family had arrived, with a festive meal around the pool where the kids were playing and the "not kids" were taking and interacting. It was really great watching everyone interact during the day. The pool received a great workout. At one point I believe it would have been possible to walk across the pool on the floaties. But the kids were having a lot of fun and I enjoyed watching them have fun. Today promises to be an even more full day as the gathering expands to include a few who had not yet arrived yesterday. It should be more exciting than a three-ring circus. Exhaustion should ensue about nightfall. 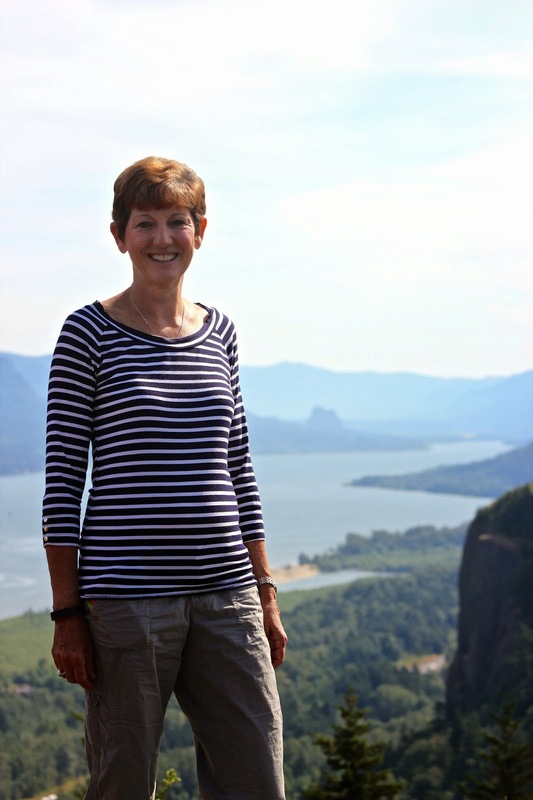 There is a spot at the entrance of the Columbia Valley Gorge, Oregon, where you actually get to stand and enjoy the grand view of the expansive valley below. It is called Vista House. From this location it is possible to look west towards Portland and east towards the deepest parts of the Columbia River Gorge. It is one of those natural beauty locations that made me pause and just enjoy the handiwork of God. The beauty of the views are stunning. I stood there for quite a while just enjoying the view, but since this was the beginning of the day, I had no clear idea of what was still ahead. But even so, this was worth the price of admission. Did I mention that it is free? Just the time invested which is well worth the effort. The last two nights in Portland, Oregon, were spent at a downtown hotel, the Hotel Modera, on the corner of 5th and Clay streets. The hotel has many nice features, especially the bar area with awesome fire pits. The hotel is in a great location with most of downtown being accessible on foot, which is especially nice. I did think the rooms were small and the coffee service marginal. But the view out the window was interesting and fun. Fun? Yes, on the last morning we were there, I looked out the window to the rainy streets below and then I looked up. 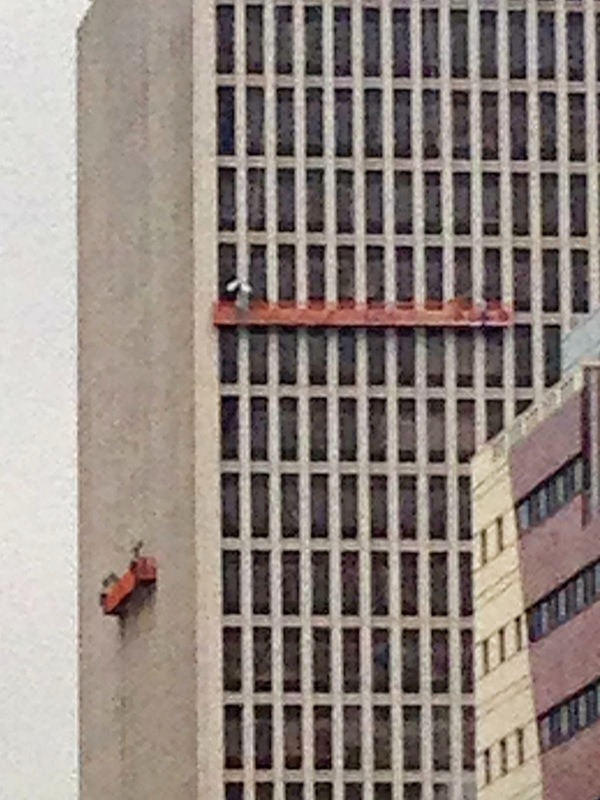 On a building some distance away there was a window washer with an umbrella. I though that kind of funny--washing the windows of the building in the rain. I took an image of it. The umbrella is visible on the left side. Washing windows in the rain. Yea--they must get paid by the hour. 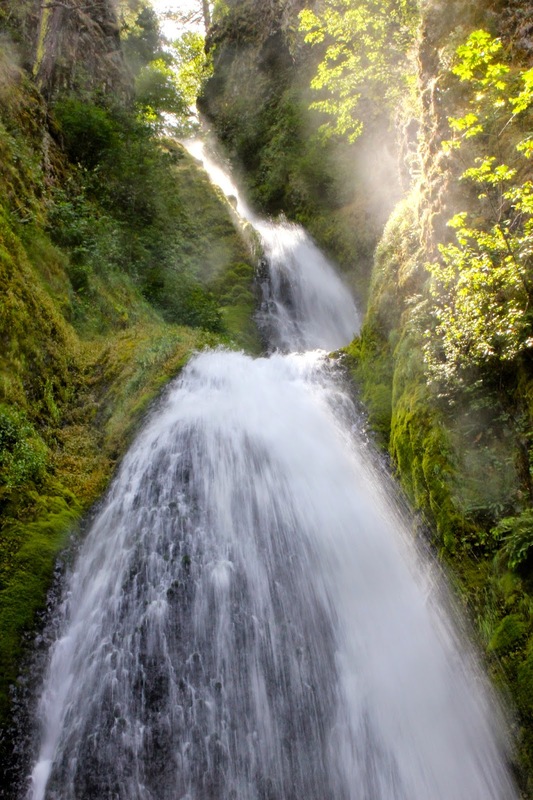 We traveled part of the Columbia Valley Gorge in Oregon, to discover the beauty and we found some stunning views and lots of waterfalls. There is just something about millions of gallons of water rising over a cliff that causes me to pause and just admire the raw beauty. Add to that some great sunlight and a nice day and you have a recipe for awesome! It seems that with every new turn there is some fantastic vista to be discovered. 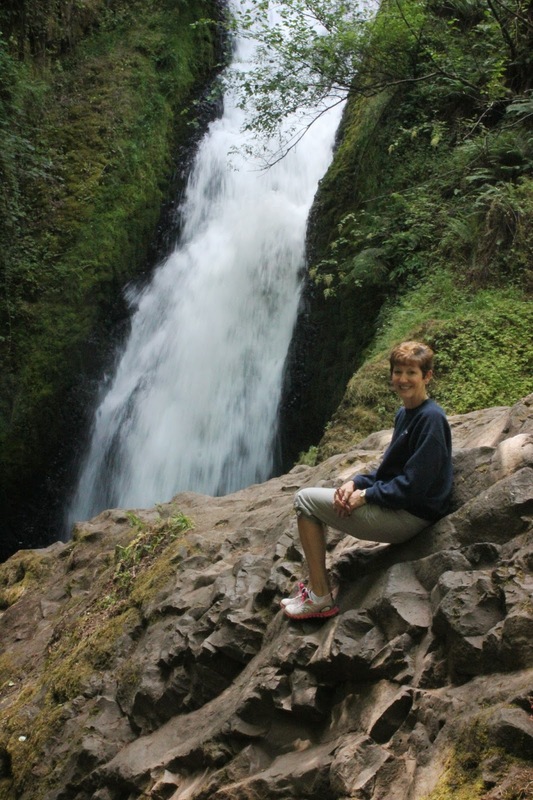 I was very pleased with the access to the falls and the trails designed to let us enjoy their beauty. The driving distance between the falls is very short, but as the day wore on, parking became an issue. There were a lot of other people out to enjoy the scenic beauty. 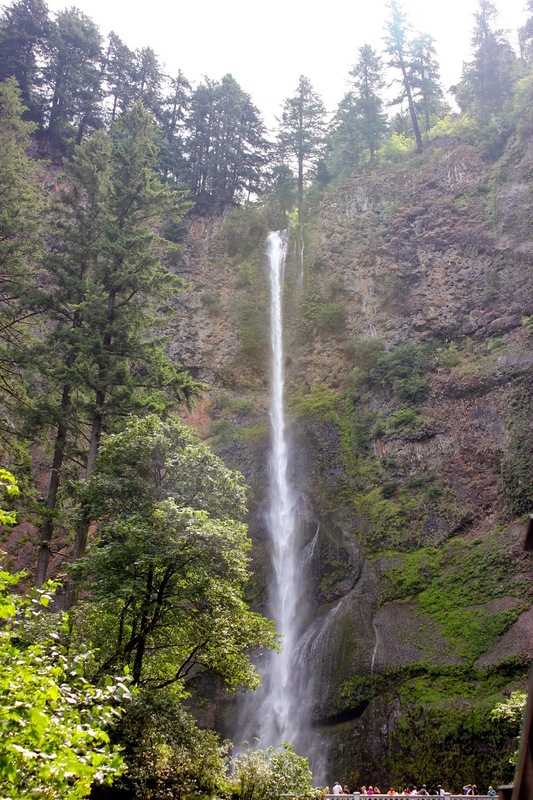 Of course the grand-daddy of the falls is the most famous of all, Multnomah Falls. 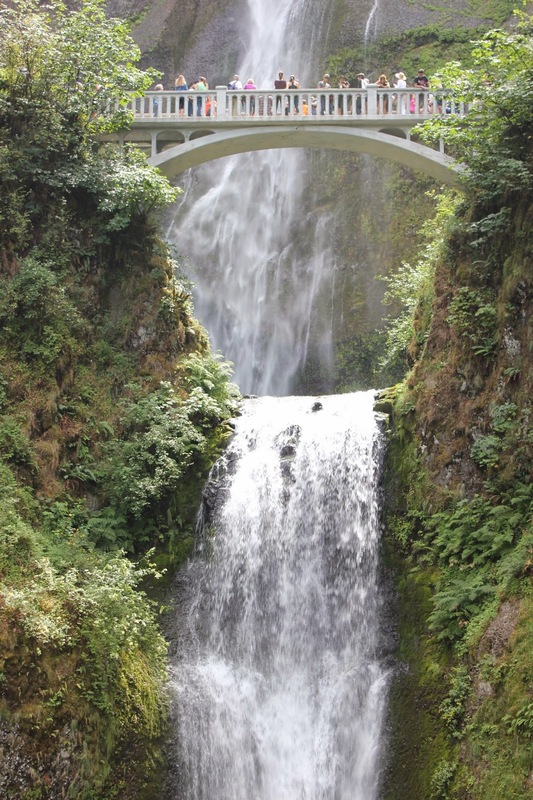 I was a bit sad when I returned and saw that we had not taken the money shot at Multnomah Falla, the image that every one associates with the bridge between the two waterfalls. But the day was absolutely idyllic and by the end of the day, as we were literally driving around Mt. 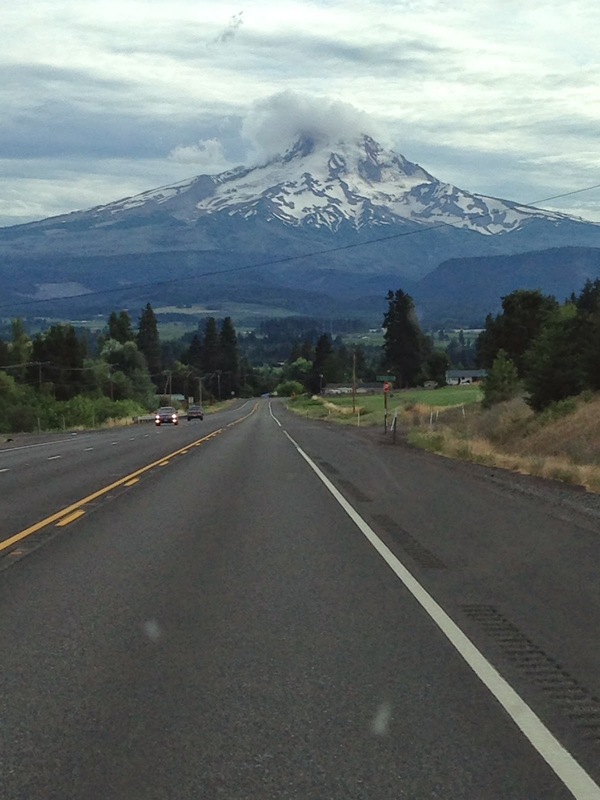 Hood, we began to realize that there is a lot more to do and see in Oregon. I highly recommend this area for a vacation. It was fabulous. I have almost 1000 images to go through. I love digital imagery. 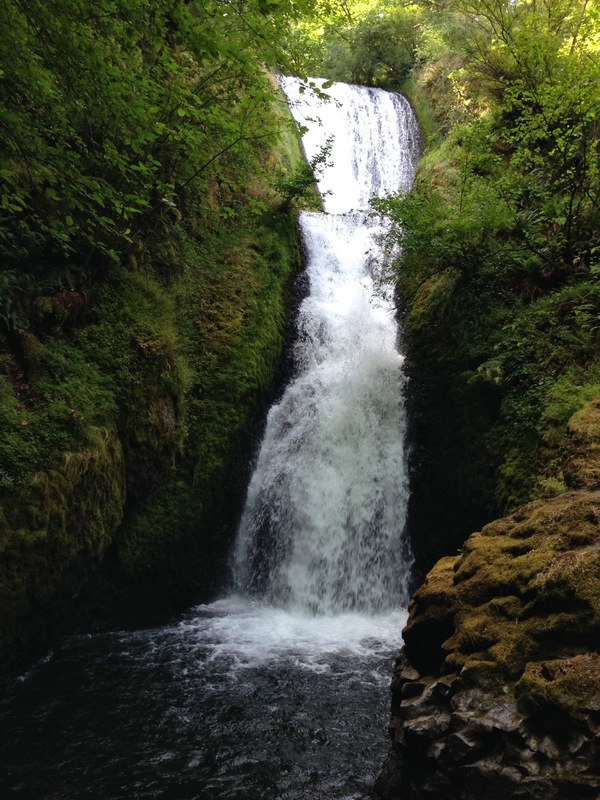 We spent an entire day driving through the Columbia Valley Gorge and truly only scratched the surface. There is so much more to do, Chris even said that she wants to make it an alternating year vacation spot. One year the beach and the next year Oregon. I have been remiss in not continuing my views out the hotel window during my vacation. We stayed in three separate locations, and I have to admin, I forgot to take a shot out the window at the second one. There wasn't much to see there, but there was a lot to hear, like the rooster at 3am. Fortunately, the couple we were traveling with were closer to the rooster. 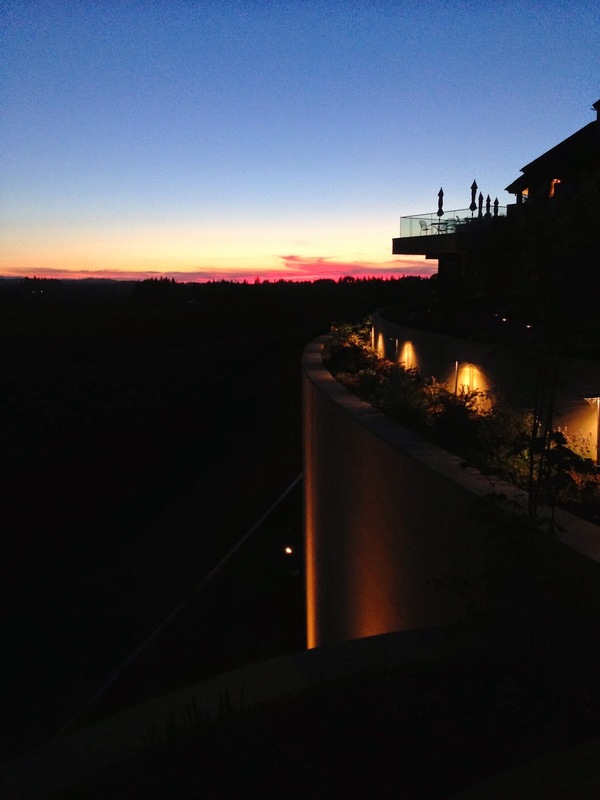 But for the first three nights we stayed at the Willamette Valley Vineyards. And the view out the window was fabulous. I loved overlooking the vineyards and seeing them in the changing light of the day. It was an awesome experience and one that I hope to be able to do again someday. 1. Traveling is fun, vacations are great, returning home comes too quickly. 2. Yesterday was the 45th anniversary of Neil Armstrong walking on the moon. It seemed to pass almost unnoticed. Sadly, the United States does not have the ability to do that right now. What follows are photos of things we have seen so far during our Oregon vacation that deserve some special attention. 3. Found along the roadway in Oregon. I want to find the wine bottle that this corkscrew fits! 4. Wow--totally color coordinated. I'll take 2! 5. Found this on a tree at the Cascade Head. 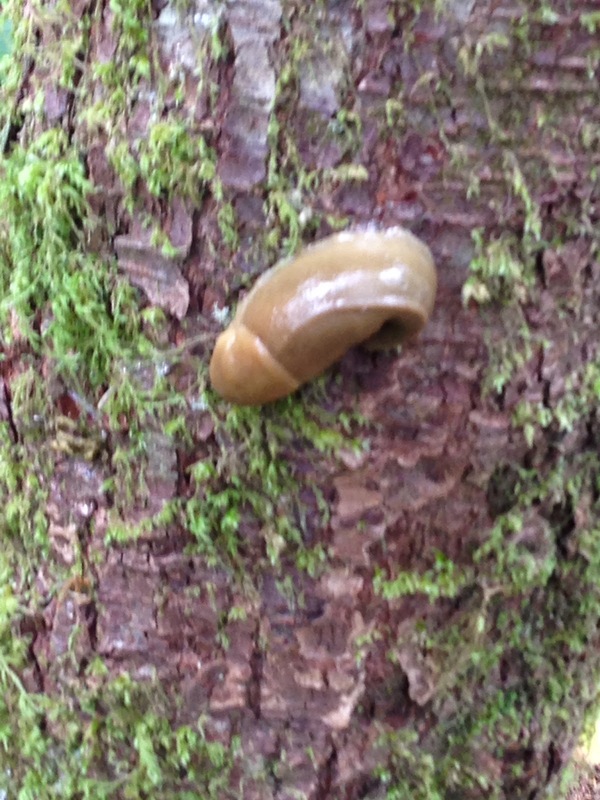 It is the biggest, slimiest slug I have ever seen. 6. OK, maybe I'll take two of these. 7. Berries? 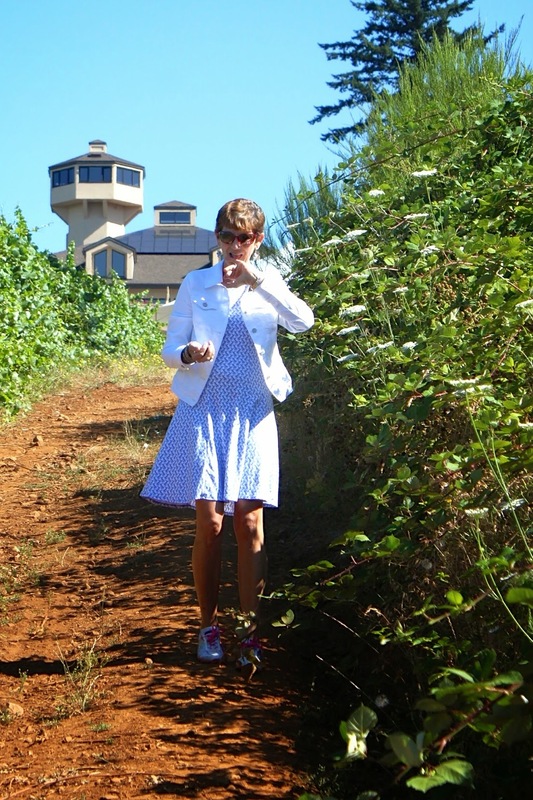 Did someone find some blackberries while walking through the vineyard? I thought we were looking for grapes? 8. In Portland. Strange things at the Saturday Market on Sunday. 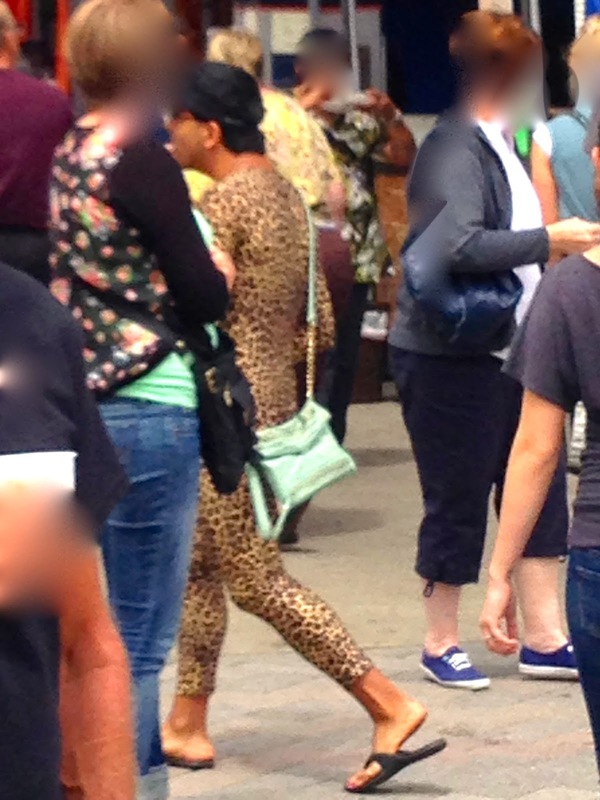 This guy was quite comfortable walking around in a leopard suit. Really! Does a 747 Belong There? After spending a hard day of driving and wine tasting yesterday--which while it sounds like as much fun as it is, is really hard work to stay focused and to not actually consume too much wine; imagine my surprise as the car rounded a corner on the highway and was greeted by a Boeing 747 sitting atop a small building near a winery named Spruce Goose. Call it unbelievable! We actually departed the highway to get a closer look and found, although closed, the current home of Howard Hughes' famous Spruce Goose along with a number of venerable old aircraft. What we stumbled upon was the Evergreen Aviation and Space Museum. Although the museum was closed, we were able to drive around and view some of the exhibits, including a MiG-29 Fulcrum, and a MiG-15, Fagot. It was while I was photographing the Fulcrum that I discovered the premier aircraft in the collection, the Spruce Goose. It is not outside, but is in the huge hangar display area. Looking behind the Fulcrum in the image, the Spruce Goose is partially visible. There I was, looking at a piece of aviation history that I never seriously thought I would see--no it was not on my bucket list, but it was something special none-the-less. I would have visited the museum, but it had already closed. I do not believe that I will have time today to return. I was also intrigued about the winery. I would love to have a bottle of wine from this vineyard, but in researching the vineyard I discovered that it does not yet have a liquor license for sale of wine from the premises, Snooth, July 17. I believe it may be because the winery recently changed its name from Evergreen Vineyards. So let's return to the Boeing 747 sitting atop the small building. I was truly shocked, when I discovered what old 747's are good for: serving as a water park. That is what this sophisticated aerospace machine has been reduced to--providing enjoyment for many children and people. I guess that is not a bad thing. What a great find in the middle of Oregon wine country! I am amazed at how quickly vacation days fly by. Truly fast, even when it seems that nothing much is happening. Yesterday we transitioned from Turner, Oregon, to Carlton, Oregon, which on the map does not seem far, but the day was not about the destination. It was about the journey. What a fabulous journey it was. The travel portion of the day started and ended in wineries (duh, where else would you expect to find me). I will be publishing reviews of the wineries I visited in my wine blog. The highlight of the day was a hike to the Cascade Head for a stunning view of the Pacific Ocean where the Salmon River empties into it. 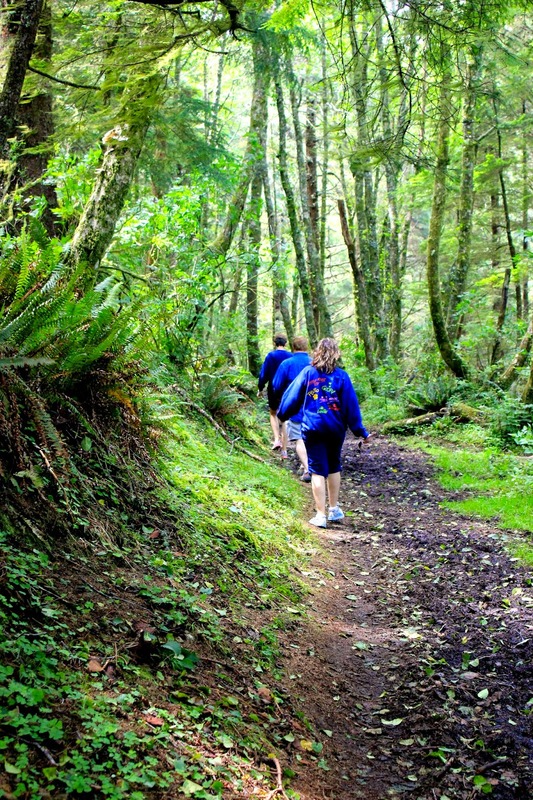 The hike was easy, about a mile each way after parking three miles into the forest along a dirt, yes dirt and gravel road that took us a long time to find. The forest was about 20 degrees cooler than the open areas protected from the ocean breeze. One of the highlights of the hike was having an elk cross the trail about 100 yards ahead of me. All I was able to capture was a blurry image of the event. He was a magnificent creature. I noted other elk crossings along the trail and I surmise that elk use the same trails over again. The forest, which was the greater portion of the trip, was full of plants and every so often I could get a glimpse of the ocean. But it was not until breaking out of the forest into the grassland for the final few hundred yards that the magnificent beauty of the area came into full view. I can sum it up in one word: stunning! This hike was fully worth the time and the enjoyment of getting out of the car an being with nature. The walk through the forest reminded me of the great diversity of life that forests support. I enjoyed the drive to the trailhead. It was along a gravel road that was barely wide enough for two vehicles to pass. I was driving a rental vehicle that had 440 miles on it when we picked it up and looked like it had just come off the showroom floor. By the end of the trip into the forest, it did not have that new car look anymore! I wondered around each twisty turn what would happen should we meet another vehicle, fortunately, although I was planning for the eventuality, no other vehicles were met in either direction. Yes, it was that deserted. 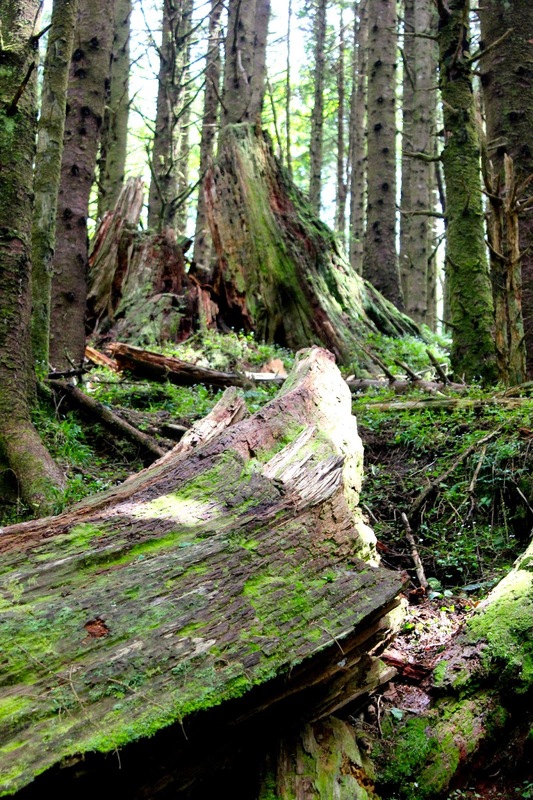 The forest was mature and evidence of its age was everywhere in the trees that had been felled and the subsequent growth and life springing from the once tall and strong but now soft and moist wood. A great stop and an easy hike. I highly recommend taking the time to enjoy the hike and the view at the end of the trail. 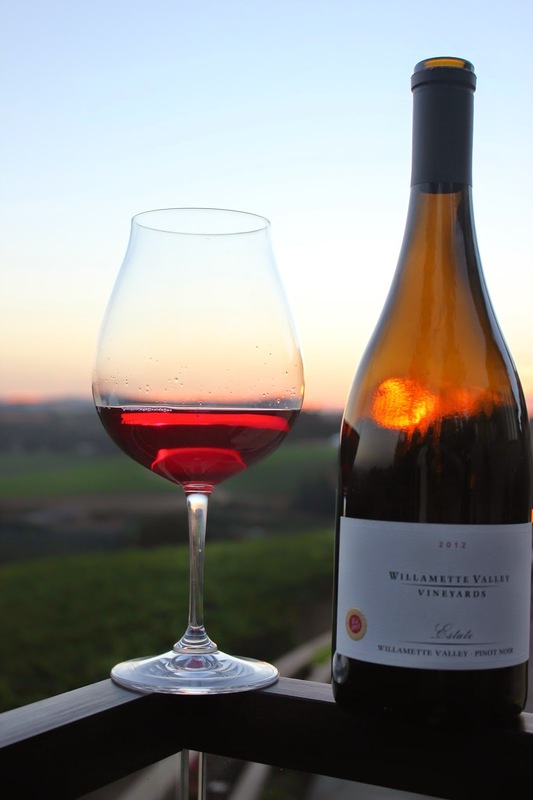 Last evening, I sat in my suite watching the sunset fall on the Willamette Valley. The mountains, silhouetted by the setting sun beyond, remained in my sight for a very long time as the light slowly left the sky. Howe awesome it was to sit and watch the sun put the exclamation point on a fantastic day. I remembered the multitude of things accomplished and learned mostly about wine making and viticulture. There was a lot of wine drinking and sampling to see the results of the process, but last evening was about the sunset. Taking a page right out of our Key West vacation book, at the end of the busy day we Chris and I celebrated with our own sun down party. It was a celebration of vacation and all of its associated activities. We actually did not travel during the day, but stayed in one place and got an in depth education and immersion into the wine industry. Sounds like work, but it wasn't. With the ending of the day, we marked the last full day of our vineyard based portion of our vacation. Chris noted this morning, usually on vacation we walk the beach in the morning--the past mornings we have been walking the vineyard. There is something satisfying about walking a vineyard in the morning and checking out the grapes--or wine on the vine. And the day was over, as was the first chapter of our vacation. On to the next part. And the Fourth was a Bang!